The 25th Spirit of Woodstock Festival 2017 in Mirapuri, Italy, from Wednesday 19th July till Sunday 23rd July 2017: 5 highlight days of free music revolution with free entrance and friendly prices for camping, food, drinks and Hotel accommodation, together with the Mirapuri Open Nature Camping and Mirapuri’s one and only original Bavarian Oktoberfest in Italy presenting open air concerts, hearty festival feastin’ and drinkin’, groovy festival-bazaar and international coming together. A special highlight for 2017 is the Michel sings Bob Dylan Thursday featuring great poetic and New-Topical-Songs by Michel Montecrossa and Bob Dylan. Michel Montecrossa together with Mirakali, Diana Antara and their band The Chosen Few play the ‘The Pulse Of Europe’ Concert for the Mirapuri World Peace Festival 2017 presenting Cyberrock, Dance, Electronica and acoustic songs of Joy & Love on 1st July 2017 in the Hall of Fame of the Omnidiet Hotel in Mirapuri, Italy. The set list includes great peace songs like the opening ‘Pulse of Europe Song’, ‘Peace And Love – Pace E Amore (Love Is The Answer)’, ‘Ich Suche Nicht, Ich Finde: Ich Bin Bei Dir – I’m Not Searchin’, I Am Findin’: I Am With You’, ‘Song From The Home Of Love’ and many more. In addition to the ‘The Pulse Of Europe’ Concert you can see the ’Energy Of Art’ Exhibition of 102 Michel Montecrossa paintings and drawings in the Mirapuri New Art Gallery of the Omnidiet Resort and Business Hotel. For the Mirapuri World Peace Festival 2017 Program click here. In addition to the JOY & LOVE VISION CONCERT Concert you can see the ‘Energy Of Art’ Exhibition of 102 Michel Montecrossa paintings and drawings in the Mirapuri New Art Gallery of the Omnidiet Resort and Business Hotel. For the Free Cinema Filmfest 2017 Program click here. Vor dem Konzert kann man die DEEP BRAIN ART Ausstellung mit 212 neuen Michel Montecrossa Gemälde und Zeichnungen sehen. Michel Montecrossa together with Mirakali, Diana Antara and The Chosen Few plays the ‘The Power Of Love & Freedom Christmas Concert’ on 17th December 2016 from 22:00 – 24:00 in the Omnidiet Music-Hall. The concert presents great acoustic & electric Cyberrock Songs for Mirakali’s Birthday and for Christmas. ‘The Love & Freedom New-Topical-Song Concert’, one hour live with Michel Montecrossa and his acoustic guitar, together with Mirakali on 26th November 2016 in the Filmaur Multimedia Haus at Gauting near Munich, Germany. Michel Montecrossa presents New-Topical-Songs for Friendship and Integration from 21:00 till 22:00. Michel Montecrossa together with Mirakali, Diana Antara and The Chosen Few plays the ‘Looking Forward’ Acoustic & Electric Concert on 28th October 2016 from 20:00 – 21:30 in the Omnidiet Music-Hall. Das ‘Ich bin der Typ’ internationale Cyberschlager Oktoberfest Konzert von Michel Montecrossa und seiner Band The Chosen Few präsentiert am 1. Oktober 2016 im Filmaur Multimedia Haus in Gauting bei München von 22:00 bis 24:00 Top Gute-Laune Cyberschlager Musik. Das ‘Ich bin der Typ’ Cyberschlager Oktoberfest Konzert bringt die beste Seite Deutsch-weltoffener Lebensart mit ihrem positiven Frohsinn, ihrer Geselligkeit und unkomplizierten Herzlichkeit. Die gute-Laune ‘Ich Bin Der Typ’ Cyberschlager Songs singen mit der Stärke der Freude und des Glücklichseins von echten Empfindungen, die direkt aus dem Leben kommen. Das ‘Ich bin der Typ’ internationale Cyberschlager Konzert von Michel Montecrossa und seiner Band The Chosen Few präsentiert am 20. August 2016 im Wirtshaus zum Isartal ab 20 Uhr beste Gute-Laune Musik. Das ‘Ich bin der Typ’ Cyberschlager Konzert bringt die beste Seite Deutsch-weltoffener Lebensart mit ihrem positiven Frohsinn, ihrer Geselligkeit und unkomplizierten Herzlichkeit. Die gute-Laune ‘Ich Bin Der Typ’ Cyberschlager Songs singen mit der Stärke der Freude und des Glücklichseins von echten Empfindungen, die direkt aus dem Leben kommen. Michel Montecrossa together with his band The Chosen Few plays the ‘Love & Freedom Heal – Liebe & Freiheit Heilen’ Concert during the Mirasiddhi Wellness Festival and the Sunrevolution Festival of Work 2016 in Mirapuri, Italy. It is a concert of great value songs that convey the encouraging message of working together for building a world that truly manifests a life of Love & Freedom. Michel Montecrossa, der internationale Cyberschlager, Cyberrock, Orgastica / Techno-DJ und Cyberdance-Electronica Maestro lädt zu seinem Cyberhalloween Concert ein, das er gemeinsam mit seinen Ladies Mirakali (Orgastica-DJ), Diana Antara (Techno-DJ) und seiner Band The Chosen Few am 31.10.2015 von 22:00 – 1:00 in der ‘POINT’ Diskothek • Carl-Benz-Straße 13 • 82205 Gilching • (Veranstaltungsinfo: Tel: 089-850 8555) abgehen lässt. 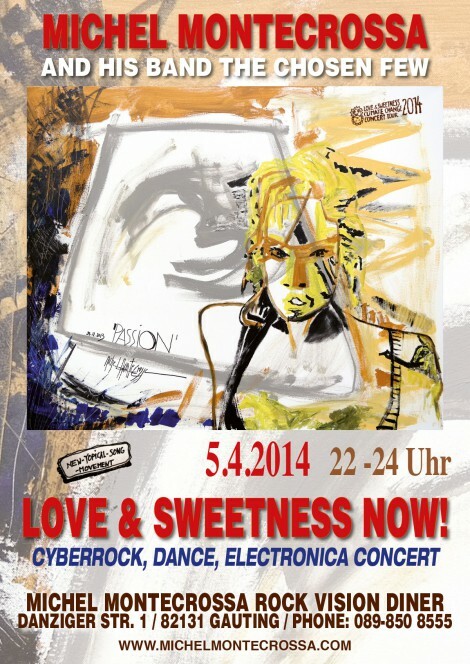 Michel Montecrossa’s ‘Cyberhalloween’ Konzert ist die angesagteste Monster Party in Town mit ultrageilem Cyberschlager, ultraheißem Cyberrock, ekstatischer Cyberdance-Electronica und hirnbefreiender Orgastica-DJ und Techno-DJ Power. Michel Montecrossa und seine Gitarre begleitet von Mirakali (E-Gitarre) & Diana (Akkordeon) präsentieren das ‘END ALL YOUR WARS – BEENDET ALL EURE KRIEGE’ New-Topical-Song Konzert verbunden mit einer Friedens-Gedichte Lesung von Mirakali. “Das ‘End All Your Wars – Beendet all eure Kriege’ New-Topical-Song Concert presents 18 English and German Songs that can make you think about us and our world. Michel Montecrossa together with Mirakali and Diana Antara play the ‘Love & Sweetness Now!’ Concert on 5th April 2014 at the Michel Montecrossa Rock Vision Diner in the Filmaur Multimedia House. Before the concert you can come to the opening of the CREATION Exhibition of new Michel Montecrossa paintings and drawings. Before the concert you can see the EXPRESSION Exhibition of new Michel Montecrossa paintings and drawings. 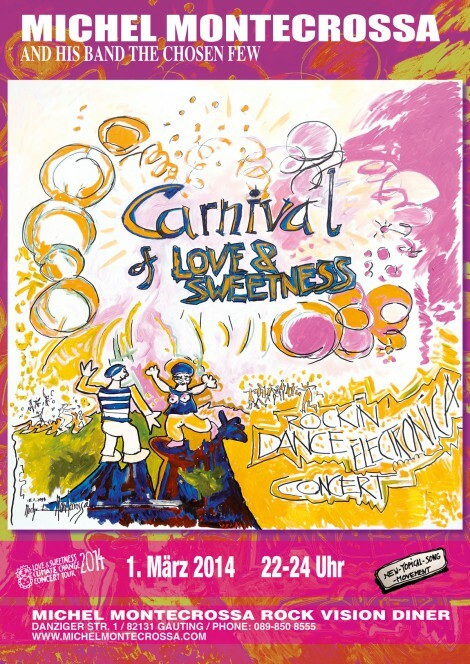 On Tuesday 31st December the Love & Sweetness New Year concert will lead you into January 1st 2014 with happy and inspiring dance and love songs. Before the concert excellent New Year menus (vegetarian and non-vegetarian) will be served and you can see the Creativity Art Exhibition of new Michel Montecrossa drawings and paintings. During the Electronica Love World Action Concert in the Michel Montecrossa Rock Vision Diner in Gauting near Munich on 28th September 2013, Michel Montecrossa, Mirakali and Diana Antara bring their Top Electronica Music to the stage. It is an exciting adventure into the experience of Cybernetic Consciousness Expansion and Visionary Future Building. Michel Montecrossa, Mirakali and Diana Antara present on 28th September 2013 from 22:00 – 24:00 the best of their Electronica Dimension as the reality of a higher Sphere of Consciousness to which we can open ourselves. On 28th September there is also the opening of the ‘Expression’ Art Exhibition of new Michel Montecrossa paintings and drawings at 19:00 which you can visit before the concert. “The songs I play together with Mirakali and Diana Antara at the Electronica Love World Action Concert are songs of Psyche and Eros that are like paintings moving in the Stream of Consciousness of Ideal Cybernetic Electronica. Our music is an adventure into the Future of the Bright Earth of Peace, Energy, Harmony and Joy. It is the Celebration of Humanity no longer falling back into terror, conflict, hate and darkness. Also on 28th September 2013 starting 19:00 is the opening of the Expression Art Exhibition of new Michel Montecrossa paintings and drawings for the Autumn-Winter season at the New Art Gallery of the Filmaur Multimedia House. The Expression Art Exhibition is presented at the extended New Art Gallery in the Filmaur Multimedia House in Gauting near Munich, Danziger Str. 1, Phone ++49-89-850 8555. During the Dreamspace Electronica Festival 2013 in Mirapuri on 9th and 10th August, Michel Montecrossa, Mirakali and Diana Antara bring their Top Electronica Music to the stage. It is an exciting adventure into the experience of Consciousness Expansion and Visionary Future Building. Michel Montecrossa, Mirakali and Diana Antara together with the guest bands Anna Aliena, Unort and Anarcord present on 9th and 10th August from 19:00 – 24:00 the best of modern electronica at the Dreamspace Electronica Festival 2013 in Mirapuri, Italy. Michel Montecrossa together with his band The Chosen Few play at the Spirit of Woodstock Festival 2013 in Mirapuri, Italy during ten days, 26th July – 4th August, presenting 20 concerts featuring brand-new songs from Michel Montecrossa’s ongoing New-Topical-Song and Cyberrock concert tour. Michel Montecrossa and his band The Chosen Few play along with international guest bands creating together with them the stimulating and happy flair of the most important festival of the free music revolution.